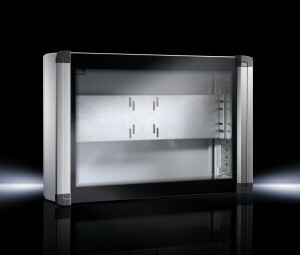 RITTAL says its stylish housings, with a protection category of IP 65 shielding devices from exposure to dust and water jets, are designed to accommodate TFT screens up to 24” (measured along the diagonal) in the popular 16:9 and 16:10 widescreen formats. A full-width viewing window made from a single-pane of safety glass maximises the display area and a combination of rounded edges and aluminium grips prevent injury. The side facing the operator has an attractive look and feel. Housings containing TFT screens can be mounted quickly and efficiently thanks to a holder with the VESA 75/100 mounting hole pattern. A hinged door on the back of the housing provides easy access to the device. Manufactured from sheet steel, for convenience, pre-punched holes are provided in the reinforcing plate.